On November 7, the 4th International Conference “Readings of Narekatsi” took place at the Matenadaran’s Scientific Building Hall (see the program). The participants honored the memory of the honored Armenologist Armine Kyoshkeryan at a minute of silence. 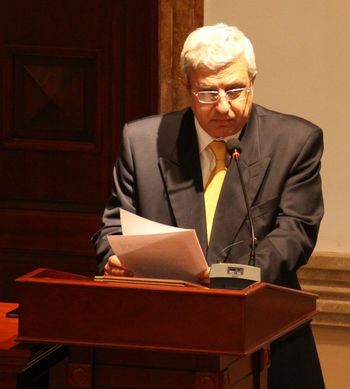 The director of the Matenadaran Vahan Ter-Ghevondyan delivered an opening speech. The director of the Matenadaran mentioned that the "readings" are also a permanent cause to remember again and again the poet and sensualist literary critic Hrachya Tamrazyan, who laid a solid foundation in Narekatsi Studies, and laid the foundation for annual “Readings of Narekatsi”. 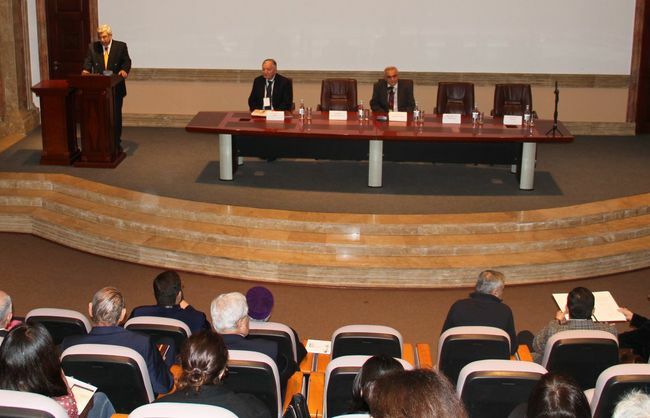 The conference was attended by international renowned Narekatsiologists: Jean-Pierre Mahe (France), Theo Maarten van Lint (Great Britain), Roberta Erwin (US), Krikor Beledian (USA), reports from Armenia were made by Henrik Bakhchinyan, Reverend Bishop Shahé Supreme Archimandrite Ananyan, Arusyak Tamrazyan and Hrachik Mirzoyan. The conference participants made the following reports: 1.Jean-Pierre Mahe - Attached to Grigor Narekatsi "Order and rule of prayer" among the outlines of "Book of Lamentations" 2. Reverend Bishop Shahé Supreme Archimandrite Ananyan - Apocryphal narration of healing of disabled man according to Saint Grigor Narekatsi's "Prayer Book" 3. Theo Maarten van Lint - Rebukes on Relationship between Grigor Narekatsi and Vardan Anetsi 4. Roberta Erwin - "Your embalmed word" the fragrance of cleansing in the prayers of Grigor Narekatsi 5. Krikor Beledian - The Logical structure in the “Book of Lamentations” 6. Arusyak Tamrazyan - Some Features in the creating of symbols in the work of Grigor Narekatsi (odes, commentaries) 7. Henrik Bakhchinyan - The poetical genres founded by Narekatsi 8. Hrachik Mirzoyan - What was slandered about Grigor Narekatsi? At the end of the conference two books were presented: the Dutch translation of Grigor Narekatsi's "Matyan" and Grigor Narekatsi's "Odes" book, which contained the notes of odes and canticle, as well as a CD by Gevorg Hunanyan and Anna Mayilyan.